What a great Saturday! I had my first experience with a sword, in the most capable hands out there -- those of Mavi, the blue-haired Maven of Mayhem. Really, she's not scary at all -- but she's great at teaching you how to thrill an audience with a dangerous-looking prop. We learned quite a few basic moves for wielding a sword and using it to accent movements and frame your body -- but not balancing it on your head! Mavi's advice: wait at least 45 seconds before you go there, lest you shoot your wad too early. So to speak. 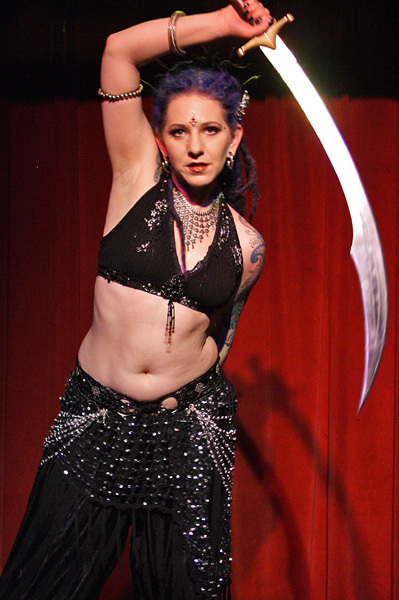 I had a great time working with my new scimitar (and with a big honkin' Moorish scimitar that I borrowed for a while). After the workshop, I sped home to get ready to perform in the Tribal Carnivale show at the Red Light Cafe, presented by Awalim. I've seen so many great shows there -- it was so exciting to finally be on that stage with Banat Almeh! The women I've been performing with are just uniformly awesome -- rehearsals have been so much fun. Our performance went really well (and I didn't fall off the tiny stage, yay). I've done a lot of troupe performances, and I don't think I've ever heard the word "tight" used so many times to describe a number I was in -- oh, and I got a double thumbs-up from Mavi! I'm looking forward to seeing the video. My fabulous husband Charlie overcame the lighting challenges and got hundreds of great photos -- I've spent most of today editing and tweaking them. Please check out the album on Facebook! With the awesomely casual atmosphere created by Ziah and Awalim, I was able to watch all of the other performances, which is always great. 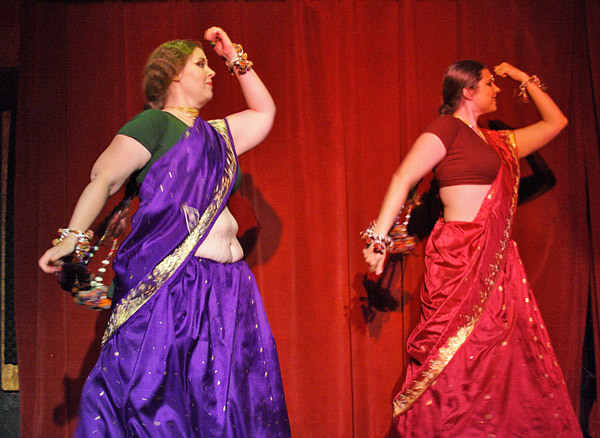 I was really thrilled by a Bollywood-style dance performed by two of my troupemates from Athens... very folkloric, in an Indian way -- just the kind of thing I'm a sucker for. Anything that looks like village maidens dancing around thinking about the boys they're crushing on just makes me incredibly happy. Teejei did a really moving fusion solo that seemed to me to tell a wonderful little story with equal parts pain and hope. And I was really excited to be sharing the stage with Melanie, who also performs with Blast-Off Burlesque (I am a total Blast-Off geek fangirl). There were lots of great performances, including a new live music project and lots of lively stuff from Awalim. And then, of course, there was Mavi, who was just fabulous. In classic "workshop show" style, she did all the moves we learned with her sword, including an amusing little reminder to wait before putting it on your head! Really inspiring. What a fun night! Wow, Barbara! Great write up. 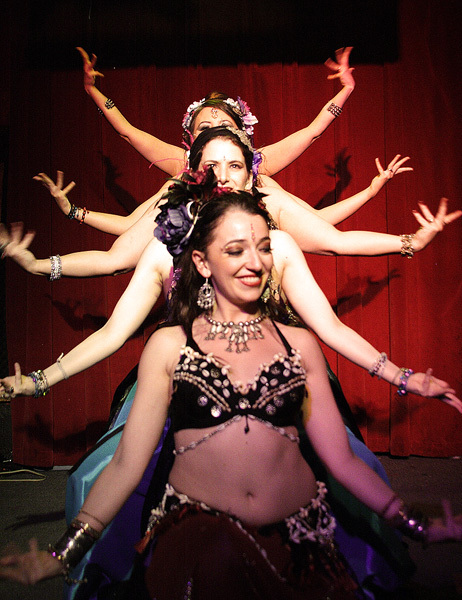 A Busy May Day for Belly Dancers! NEW ATS Classes with Teejei at Dance 101! Shimmy Mob Registration Deadline is Tomorrow!